This story was produced in collaboration with the Food & Environment Reporting Network (FERN), a non-profit investigative journalism organization. Searcy himself first came to Khe Sanh in 1992, twenty-four years after Tet and twenty-four years after he shipped out of Vietnam at the end of a tour of duty with the 519th Military Intelligence Battalion in Saigon. He is a tall, lean man with a head of thick, gray-white hair and a courtly charm that seems entirely without effort or artifice. His speech still has the soft cadences of his hometown of Athens, Georgia. Probably no American, and certainly no veteran of the US military, has ever immersed himself so completely in the realities of Vietnam. The war defined Searcy’s young adulthood, and its aftermath has defined the past third of his life. 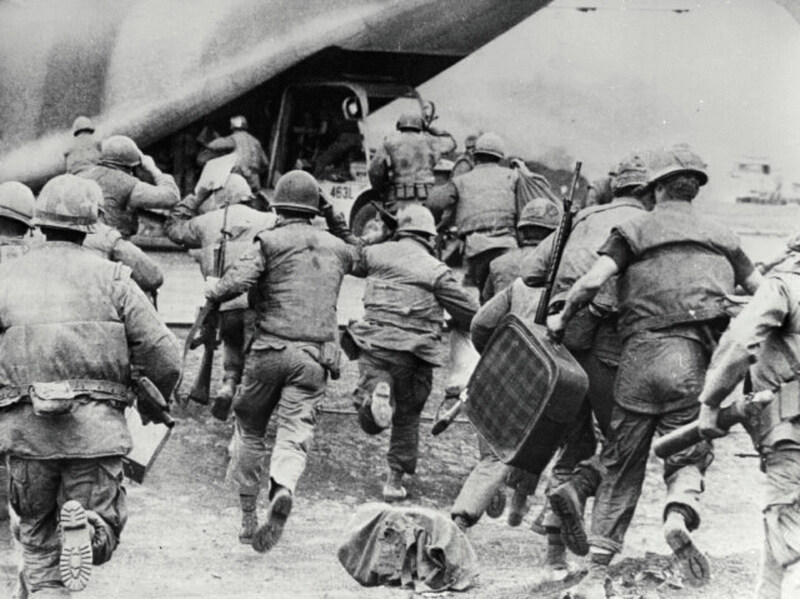 That initial visit to Khe Sanh was part of his first trip back since the war. In January 1995, after returning for the third time, he moved to Hanoi, fell for the city’s magical blend of elegance and chaos, and has never left. He turned 70 last September—or perhaps it was 71, he said; it all depended on how you count time. When friends invited him to a surprise birthday party, they reminded him that Vietnamese add a year for the time spent in the womb. The best estimates are that about 40,000 have been killed by unexploded ordnance since the war’s end, with another 65,000 maimed. “As we landed, both of us had a panic attack,” he said. “For God’s sake, what are we thinking? We’re ex-GIs; the country is devastated. But I couldn’t believe the welcome we got, the curiosity. ‘Were you in the war? My father was in the war. Where were you?’ But without any animosity or anger. It was astonishing.” Everywhere they went for the next month, it was the same story: not a harsh word. 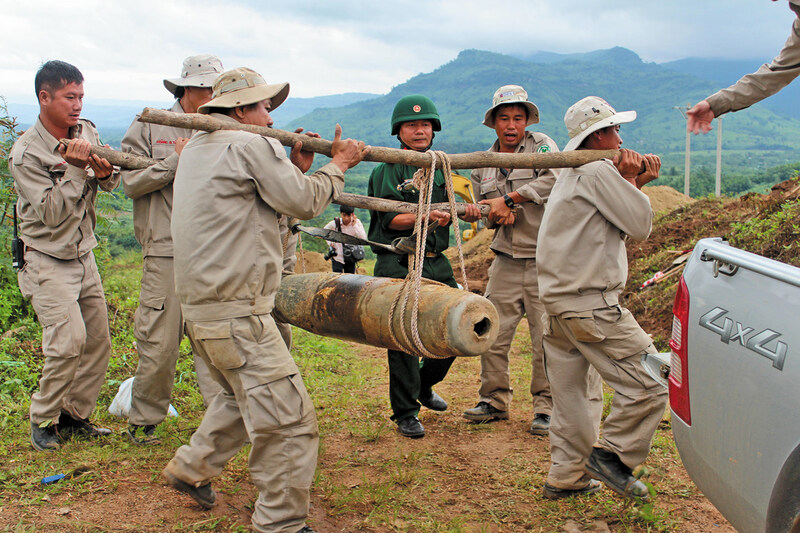 While Agent Orange remained a political third rail, unexploded ordnance (UXO) proved an easier sell. 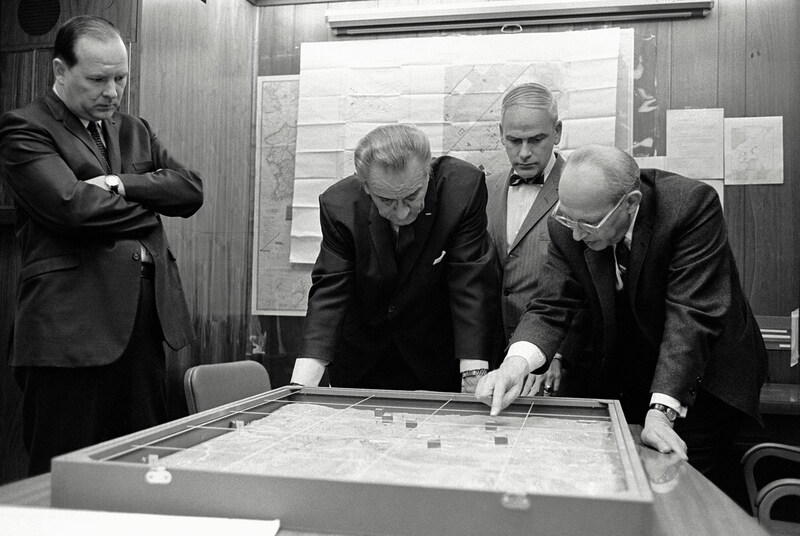 The US government offered Vietnam $3 million to help with a cleanup program, and, with Searcy acting as a back-channel go-between, the Vietnamese defense ministry was finally persuaded that there would be no strings attached. Other governments and private groups also kicked in funding. There was no better place to start than Quang Tri and the former DMZ. And so, to make a long story short, Project RENEW was born, in 2001. The acronym stands for Restoring the Environment and Neutralizing the Effects of War. Today, most of its funding comes from Norwegian People’s Aid. Project Renew has its headquarters in the bustling provincial capital, Dong Ha, where it also runs a small Mine Action Visitor Center, with its own Facebook page and a TripAdvisor sticker on the wall. “Mine” is actually a bit of a misnomer, Searcy said, for the minefields in Quang Tri were mainly around old military bases and on the beaches, and these were quickly cleared. But the word resonates with people, perhaps because they associate it with Princess Diana, who made eradication of mines her personal crusade. In reality, Searcy said, UXO includes everything from hand grenades to naval shells “the size of Volkswagens” that were fired from battleships twenty-five miles offshore. “There’s a footprint to a cluster-bomb strike pattern that’s different from any other kind of blast,” Searcy explained. “If you find one or two bombs, you can assume there are others in the immediate area.” It helps, he said, that the US Air Force has turned over many of its maps, tracking the planned bombing runs—although pilots had discretion to drop bombs wherever they saw fit. Sometimes the path of a cluster-bomb strike will match that of an Agent Orange spraying run, fighter jets having cleared the way to eliminate the risk of ground fire. The team leader showed me a map of the survey area, divided up into a color-coded grid with hundreds of smaller boxes. Red for cluster bombs, blue for other munitions, dark green for all clear. We were in box 103. Covering about one square kilometer, it had been under cultivation with sweet potato and cassava. His team had already found one mortar round and two cluster bombs, and five men with mine detectors, accompanied by a paramedic, were sweeping the field for more. I was told to turn off my cellphone, because it would interfere with their signal. And to follow exactly—exactly—in their footsteps. Thanks largely to Senator Patrick Leahy, the State Department will continue to provide annual funding to help with ordnance removal. The low, rolling hills were carpeted with long, even rows of spindly trees. It had all been replanted since the war, Hien said, first with pepper and then with stands of rubber and, above all, acacia, a fast-growing wood used in the making of paper and furniture. “In the old-growth forests, there used to be bears and monkeys and wildcats,” Searcy said. “Now it’s all just acacia, acacia, acacia.” Though the new plantation monoculture is drab by comparison with the lush ecosystem that once existed, it’s part of an intensive government effort to restore badly eroded lands that were sprayed with herbicides and then invaded by coarse grasses, while providing some cash income for local farmers. No one could dispute that Agent Orange was responsible for denuding the forests. But was it also the reason for the disabilities that afflicted Hien’s classmates? That question has occupied the tortured intersection of science and politics for forty years now, though for many Vietnamese, the connection is an article of faith. Agent Orange was a fifty-fifty mix of two components, 2,4-dichlorophenoxyacetic acid (2,4-D) and 2,4,5-trichlorophenoxyacetic acid (2,4,5-T). Seven different companies manufactured it on government contracts, Monsanto and Dow Chemical being by far the biggest. They insisted the stuff was safe, as did the US military. Psywar teams were routinely sent into villages after a spraying run to deliver the message, in the words of a declassified Air Force document, that these were “standard defoliants which are widely used throughout the world in controlling weeds and other vegetation. They have no harmful effects of any kind on human or animal life.” American and South Vietnamese troops often sluiced out the residue from the empty barrels, cut them in half and used them as barbecue pits, or punched holes in them to make improvised showers. Chuck Searcy heard tales of Marines drinking cupfuls of dilute Agent Orange as an initiation ritual. But there were two problems with the assertion, true enough on its face, that these were just your everyday weed killers. First, they were sprayed on Vietnam in concentrations up to ten times higher than when used in the United States. More important, a combination of military imperatives and market forces turned them lethal. In the course of accelerated production, the Agent Orange was contaminated with an unwanted byproduct, 2,3,7,8-tetrachlorodibenzo-para-dioxin, or TCDD. This is sometimes referred to as the most toxic substance known to man, depositing itself in fat cells, disrupting hormone systems and triggering complex cellular and genetic changes. In the natural environment, dioxin can persist for decades, passing through soil into water, where it gloms on to organic matter in sediment and from there can move on up the food chain. But the other herbicides were toxic too, Stellman told me when we met in New York. Cacodylic acid, the active ingredient in Agent Blue, is an arsenical that has promoted a variety of cancers in rats. Agent White was a mixture of 2,4-D and Picloram, a proprietary product of Dow Chemical that contains hexachlorobenzene, a probable human carcinogen. Agent Purple, Stellman said, had even higher levels of TCDD than Agent Orange. 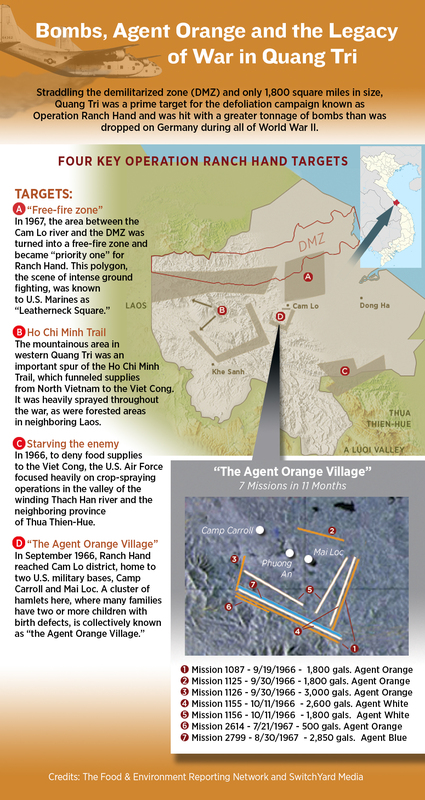 In one of Quang Tri’s ten districts, an astonishing 117 house­ holds had five or more family members who were classified as Agent Orange victims. All this was more politics than science. There was no doubt, Stellman said, that Agent Orange, the larger herbicide program and the war in general had done terrible things to people, both Americans who served in Vietnam and the much greater number of Vietnamese whose lives were torn apart. But cause and effect? It was one thing, she said, to step on a cluster bomb in Quang Tri and have your legs blown off. No great debate there. But serving in Vietnam and later contracting a soft-tissue sarcoma or Parkinson’s disease, let alone Type 2 diabetes? Those links could never be convincingly demonstrated without a large-scale epidemiological study—and the fact that none had ever been conducted was, to her, the real scandal. Until now, reconstructing exactly what happened in these localities during the war would have been next to impossible. But after years of painstaking research, Stellman has opened up radical new possibilities. With funding from the National Academy of Sciences, she and her colleagues at Columbia have crunched vast quantities of data about the Ranch Hand program, including details of more than 9,000 flights, to calculate the precise “exposure risk” of those who were in or near the spray path on particular days. Using Stellman’s database, which is not yet public, I was able to go into some of the worst-affected villages of Quang Tri and mesh the flight records and the exposure index with the accounts of families with disabled children who were present at the time. By my count, going through the Air Force flight records, more than 700,000 gallons of herbicides were dropped on Quang Tri—600,000 of Agent Orange and another 100,000 of Agents White and Blue. In total gallons sprayed, this ranks Quang Tri ninth among Vietnam’s fifty-eight provinces. But arguably a more meaningful yardstick would be the volume of herbicides in proportion to land area. Measured that way, Quang Tri would rank closer to fifth. Did it never occur to America’s rural development experts that bombing and burning people out of their villages was not the best way to win their allegiance? Lanh’s younger brother, Nguyen Van Truong, sat on the cement floor, his matchstick legs splayed out at thirty-degree angles. He let out sharp little barks of laughter as he tried to wrap the family’s 6-week-old kitten in a plastic bag. Like Bong’s daughters in Tan Hiep, the diagnosis was cerebral palsy. Mit told me that the family had sold everything it owned to pay the $140 for medical tests, including all the jackfruit trees that they marketed for timber. Her terror, she said, was that she and her husband were growing old. What would happen to the boys when they were gone? The foreign tourists don’t say much as they walk from room to room, taking in the photographs of B-52s, deformed fetuses, bodies incinerated by napalm and white phosphorus, the My Lai massacre. On one visit, I saw a group of older Americans quietly studying a picture of soldiers from the First Air Cavalry waterboarding a prisoner. George BlackGeorge Black is a writer and journalist in New York. His next book, On the Ganges: Encounters with Saints and Sinners Along India's Mythic River, will be published by St. Martin's Press in 2018. His previous book, Empire of Shadows: The Epic Story of Yellowstone, which dealt with the relationship between the exploration of the West and the war against the Plains Indians, was a finalist for the 2013 Los Angeles Times Book Prize.